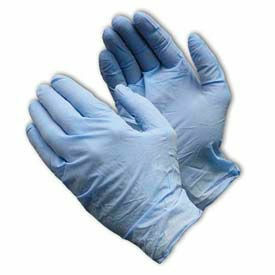 Industrial Grade, Powder-Free, Latex Disposable Gloves Provide Maximum Dexterity for Heavy use. These gloves are powder-free and textured for excellent grip. Gloves stretch easily for snug sensitive fit and maximum dexterity. Economically priced for heavy use. Thicknesses are 3, 4, 5, 7, and 14 mil. Available in micro-roughened textured, smooth, or textured finish. Colors are natural, and white. Sizes range from XS to XL. Sold in package quantities of 100 or 1000. Disposable Nitrile Gloves are used for Medical, Food Processing, and other Commercial or Industrial Hand Protection Applications. Disposable Nitrile Gloves are made of durable 3. 3,5, 4, 4.7, 5, 5.5, 6, 7 and 8-9 mil thickness nitrile materials for strength and long lasting durability. Gloves contain no natural rubber latex proteins or silicone. Designed for economical puncture resistance, comfort, dexterity and tactile sensitivity. Available grades are General Purpose, Food, Medical, Exam or Industrial, Industrial/Food, and Premium Industrial. applications.